A new update of NimBus, our latest app for public transport services, is now available! 2. Now the system will remember route segments edited by the user and reproduce them when a new route containing the same segment is created. It means, if the automatic routing between two stops is not accurate and you edit the path manually, you need to do this just once. After that, you corrected segment will appear in your new routes regardless the automatic routing. 3. 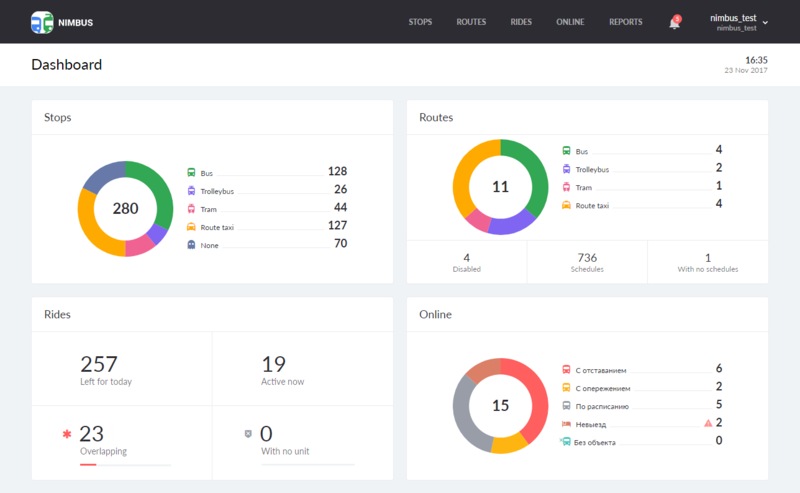 The dashboard is a new starting page in NimBus. In one glance, you can preview the contents of your ‘depot’. In two widgets above, an overall number of stops and routes is shown, together with the distribution by transport types. In two widgets below, the current situation can be estimated: problematic rides (with no unit, for example), current performance at the moment (ahead of schedule, behind schedule, etc.). In next update blocks (groups of schedules) can be expected. Stay tuned! We are looking forward to your feedback and proposals!